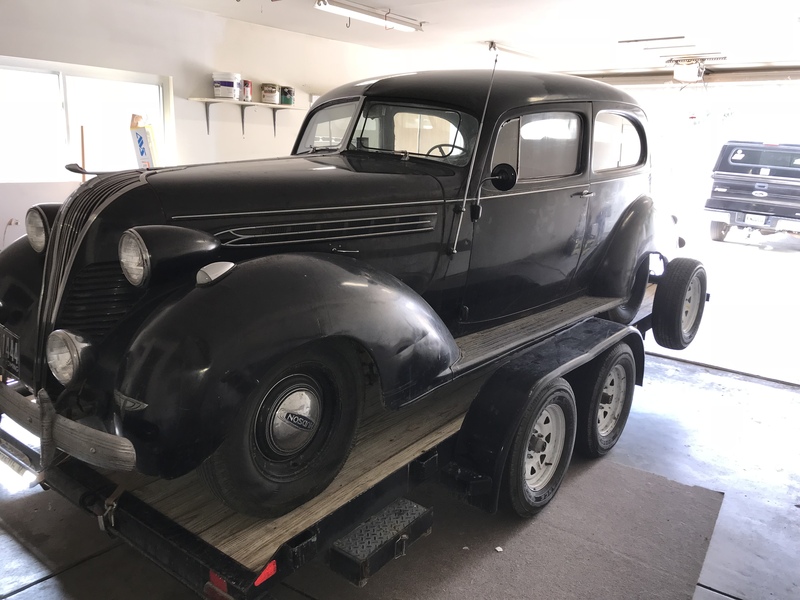 so as mentioned before, I have recently purchased a Hudson. One item the seller provided was 6 cases of 30 and 20 weight motor oil. All metal can types, half Quaker state and other half Conoco brand. Can this never opened oil be used or scrapped? Looked on eBay and it seems some people actually collect this stuff. Any advise? Depends on what they mean by "heavy duty". I would be wary of using this in a splash fed Hudson engine. You don't mention what model Hudson you have. I would bet against trying to use the stuff. I would try to sell the cans, as is, for the collectability factor. If you DO decide to drain the oil, the proper way is to put a small hole on the BOTTOM of the can, so that no holes show when displayed. Do you have a picture of the Quaker State? Being from PA, I'm interested in "Pennsylvania Oil" memorabilia. When I “can”, take pictures of the Quaker state items. A suggestion I was thinking of, when I finally get to car shows with 1937 Hudson, hand out the nostalgic oil as freebies. Just yesterday got the 1937 on the trailer to get home. Very nice car. If it hasn't been run in awhile, you would be well-advised to drop the pan and clean out the crud, before filling with fresh oil. (And don't forget to fill the upper "dipper" tray with oil!) Fresh gaskets are available. Remember, we have a wealth of technical information between all of us forum users, so don't hesitate to bring your questions to us. There are a lot of quirks with these older Hudsons which make them different from other cars, and we know 'em all! I agree, beautiful car! I collect "petroliana" and as a matter of fact, I was at the recent Iowa Gas 2018 show in Des Moines, IA a few weeks ago. It's suppose to be the largest event for collectors of gas & oil petroliana and auto advertising. Anyway, metal quart oil cans (versus composite) are generally worth more unopened with the motor oil still in them. I've been told by several people that motor oil does have a "shelf life" and that in time the additives loose their intended strength. I have a nice 10W40 Quaker State metal quart can with oil. In today's collector's market it'll bring somewhere around 5 to 10 bucks. 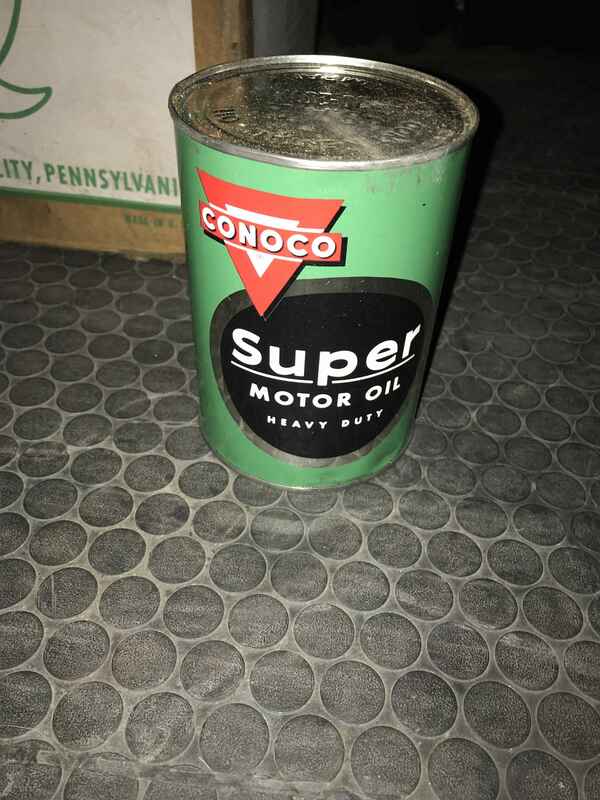 ONE of those Conoco quart cans with oil that you have cases of recently sold on eBay for $44.00!!! Yeah... I would advise against giving them away as "freebies!" Nice looking 37. I see it has defrost elements on the windshield. Keep us posted with pictures with your progress as you go along. Nice looking car. Love the 37s. My plan is just brakes, engine running, oil and lubes and a lot of cleaning, after that maybe a future owner would get this survivor in showroom condition. I’ll pass on the 1940’s oil can collection to that person. Pass them our to your hot rod buddies. I’m sure they would be thrilled to have a can for Christmas, I know I would!